I have heard that: “Cockroaches would be the only living species able to survive in nuclear fallout.” But luckily our pest control methods are a bit more refined and not as extreme! We’ve been properly exterminating cockroaches for over 30 years now. Adult: American cockroaches are approximately 40 mm long. Their elongate body is pale to dark brown with yellow markings on the pronotum. Nymphs resemble the adult cockroach but lack wings. Thorax: Cockroaches have two pairs of wings. The forewings are leathery and protect the hindwings. The American cockroach resembles the Australian cockroach but lacks a pale stripe along the anterobasal margin of the forewing. The hindwings are membranous, fan-shaped and fold flat over the body when at rest. Legs are strongly spined and designed for running. Reproduction & Life-cycle: Adults live to one year. The life-cycle of the American cockroach is 6-12 months. An adult female cockroach will lay 10-50 oothecae in that period. The oothecae contain 12-15 eggs. Oothecae are dropped or glued to a substrate when laid. Nymphs hatch from the ootheca and undergo 7-10 moults before reaching the adult stage. Distribution: The American cockroach is a cosmopolitan urban pest. The species was probably endemic to Africa and distributed to the new world with slave trade. Cockroaches have since moved elsewhere via commerce. Pest Status: In tropical-subtropical environments cockroaches tend to live outdoors. In temperate environments cockroaches live indoors and prefer warm, humid, dark habitats. The American cockroach commonly inhabits wall voids, sewers, grease traps and garbage dumps. Nymphs and adults occupy the same habitat and feed on starch, sugar, leather, parchment and fermented food. 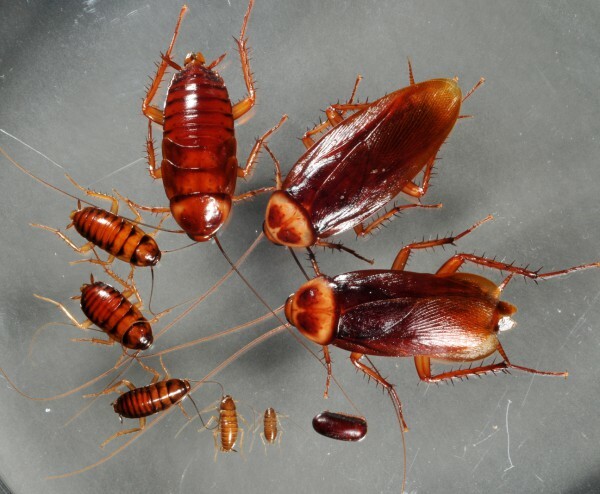 If you’re struggling with a cockroach problem and looking for advice or would like to organize a treatment or inspection then don’t hesitate to ring me up (Bruce) on 0417 251 911 or alternatively you can use our quick and easy online messaging system here.